While the mechanism (why that is so) is not exactly known, there are a few hypotheses. It’s been put forth that perhaps the process of making a permanent record of an object or event fools our brain into complacency . . . why store something that’s been captured for later viewing? This, however, is disputed by studies involving people who knew they would not subsequently have access to the photos. I’m not a researcher, but the methodology to mee seems a little flawed. I mean the methodology of having someone take a photo of something with the knowledge they would not be able to subsequently see the photos. I interpret that as the equivalent of asking me to take photos of something without any film (actual or digital) in a camera. I’m not sure I would treat it as equivalent to actually taking photos. I mean, it has a certain amount of logic that if you know you won’t have the photos your brain should step up to the recording task and when it doesn’t, it makes you wonder. However, I equate that to someone asking me to take their photo while on vacation (something I often get asked to do and also offer to do). I will remember the act, but not the people . . . because I don’t have any attachment to them nor any interest in them as persons. Maybe if I interacted with them beyond the taking of the photo, but even then, I think they would be quickly out of my memory. I personally lean toward the second hypothesis. Namely, your brain is busy operating a piece of machinery (the camera) and processing the scene in front of you not for content but for composition. Given that we can’t really multitask, it stands to reason the brain would create memories not of the event or object you’re photographing, but rather of the process of photographing said object or event.
. . . and you can test yourself. Go to an event. I suggest a street fair or something similar. For the first half of your time there, snap away as you normally do. For the second half, ignore the camera (or take it back to your car). At the end of the day, compare your memories. Which half of the experience offers more actual memories of what was going on? As much as I photograph stuff, I don’t have an opinion of this nor do I feel the need to formulate one. My procedure is to first look at what’s going on with the intent of capturing it; what I call my photographer’s eye. And yes, I can miss stuff happening outside the viewfinder when busy taking photos. That, however, is a matter of discipline; don’t lose focus of your surroundings. There is another aspect that — for me — the studies fail to take into account. The process of reviewing the photos, cropping them, examining which are keepers and which I should dump, and ultimately editing them for presentation on the blog, that whole process I think reinforces the memories. I think I might (conditionally) agree with memories immediately after the event as being sketchier for a person who took photos than memories by a person who just paid attention. But, I bet a week later the photographer would “remember” a lot more, including details that might have escaped the person who was just absorbing the experience. The reason is that the photographer gets to examine scenes in detail and without a time limit. For instance, I have extensive documentation of the classic car show I attended in Monument (Colorado) in 2014 . . . because I spent a lot of time processing the photos. I can readily admit that I retained little right after the event because — despite going through the venue twice (one for regular shots and once for macros) — I wasn’t paying much attention to the show other than as subjects for the photography. Then again, I’m not that much of a car buff so I paid a lot more attention to the colors than the subject themselves. Note: I’m not saying one is better than the other. I’m saying they are different approaches to experiencing and remembering an event. One other comment . . . my typical approach when visiting someplace is exactly the experiment I proposed above; I first snap hundreds of photos and then — once I feel satisfied I got as much as I’ll need to bore the heck out of Australians reading this blog — I’ll spend the rest of the time enjoying the experience. Sure, I might snap an additional photo or two, but I’ll be more attentive of the totality of the experience. Without having previously thought about it, I think I recognized the merging of the two is a good way to experience stuff. These are popping up in the yard outside the condo. There must be at least twenty of them scattered about. Most of them don’t survive more than a day . . . or however long it takes before a kid walks by. I had plans to document the various stages of them, but pretty much they all end at “kicked and scattered”. The joke today is another one of my favorites and it also serves as a reflection of the current state of things in politics, religion, the media, and pretty much any organization you care to mention. It’s getting so one doesn’t really know who or what to trust anymore. This is especially so if one is reasonably informed and used to think on their own as opposed to being told what to think. I don’t remember the discussion (there are many) on some TV show or other, but a statement was made and the other people in the panel just nodded as if the host had read a proclamation direct from FSM itself. I, on the other hand, immediately wanted four or five questions answered . . . questions that any thinking person would naturally come up with upon hearing what I heard. Then, the answer came to me . . . everyone. Everyone is buying this crap. Apparently, it’s what they want to hear. This was an early doodle I did . . . one of the first few just after I bought the Note 8. I call it . . . I See It But I Don’t Believe It. Hmmm, I see the logic of the research, but I don’t think it’s always true, especially when travelling. Photos do help us remember things we would otherwise forget. Yes, but that’s not what the research says. It’s that someone who takes photos will not remember as well as someone who doesn’t. But yes, if you can see the photos, then you remember. In that respect, the photos take the place of your own memory. The mystery is “why” the memories don’t form as well. On the one hand, it would seem as if concentrating on a subject or event (you have to be aware of what you’re photographing) should maybe have you remember more. But, that’s not what happens. My personal experience is that while I can look at photos from a trip and remember the things in the photos, Melisa has broader memories of the trips or vacations. She’ll tell me things that I’ll have forgotten. It could also be that it depends on what we choose to concentrate. If I’m near water, I’ll probably remember waves. Someone else might remember the color of the beach or where the snack shack sat. Regardless, interesting reading and something that — as I mentioned — you can test yourself either against yourself or comparing with someone else that’s with you but not taking photos. It’s an interesting topic. Sometimes I deliberately put my camera away because I want to really focus on what’s going on around me, rather than, as you say, the mechanics and process of taking photos. It helps me enjoy the moment more, but on the other hand afterwards I sometimes wish I had photos to look back on! Looking at the internet on your phone (a bad habit of mine!) is worse than taking photos for distracting you from appreciating your surroundings though. At least when taking photos you are still looking outwards. That — surfe the Internet on the phone — I seldom do and on those rare times I use the phone to get to the Internet, it’s an exercise in frustration. It’s not easy to navigate, too small to see everything, and even on familiar sites, they change things around to make it “more functional” (not!) . . . I don’t even surf on the tablets I have. Only on the PC. I think it has to do with the way I surf. When I research a topic, I’m very apt to shoot off and follow up on stuff and clarify things relative to the information I encounter and I can easily end up with 6-7 different tabs because I open everything in new tabs. On the phone, if I want clarification on something before continuing to read, it becomes a big production when I have to navigate back to the original thread. I’ve yet to see a browser I like as far as handling multiple tabs on a small screen. I use multiple browser tabs in the same way as you when on a PC, not even in just one browser but multiple browsers! My reading is different on a phone – I use web friendly apps and more social media, do less researching. Small and light can be handy for moments like being stuck in a queue (the British spend a LOT of time queueing) or, back in the days when Tommy was smaller, long and very boring hours spent feeding a child in the middle of the night. I’m not much for social media (other than the blog) and so not much moved to employ it as a distraction when bored. 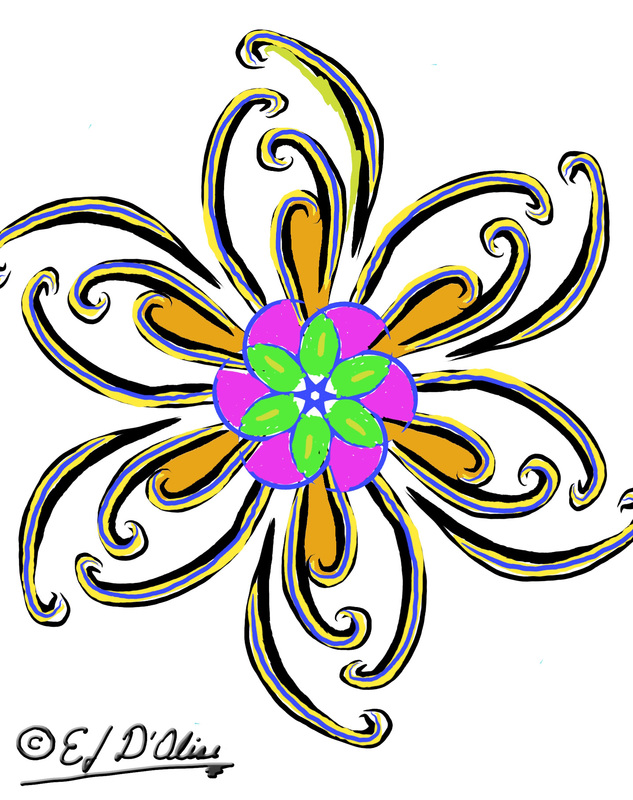 I think my favorite distraction on the phone is playing with photos and perhaps a bit of doodling. I use multiple browser windows but seldom use different browsers simultaneously. I tend to go in spurts of using one browser and then getting bored (annoyed) with it and switching to another for a bit. This also keeps me from getting too dependent on just one platform (although a lot of what I do involves some Google app or other). Seems to me the average person today can’t/wont/doesn’t like to think for themselves like everything dished up like a TV dinner as the flop in front of said TV. Is this comment supposed to be about the topic of Project 313 No. 052? I ask because it might make sense relative to that discussion. Here, it seems a bit of a non sequitur. Don’t know how it got here, was meant for somewhere else, can’t recall where, I often have several posts that I follow opened up, and get distracted which I suppose you in your wisdom will put down to senile decay. Crop and cook them, much much better way of ending than just stepped and scattered. These are parasol mushrooms (apparently, popular in Europe). However, they are growing in a cultivated lawn and I know they spray both insecticide and weed killer. I don’t think I would feel comfortable eating them because I don’t know if they absorb any of the chemicals in the soil. Also, I like very few mushrooms. Overall, my life would not be impacted if I never ate another mushroom. By the way, you are second person in my life who does not like mushrooms! It’s not that I don’t like mushrooms . . . I just that I like very few, and even then, I wouldn’t miss them if I never ate any again. It’s a bit like broccoli . . . sure, I can eat them, but why would I? I’ve heard friends who are photographers talk about this, too. That they often don’t remember the experiences because they are so focused on taking great pics, etc. I find it interesting! You’ve found a great balance! 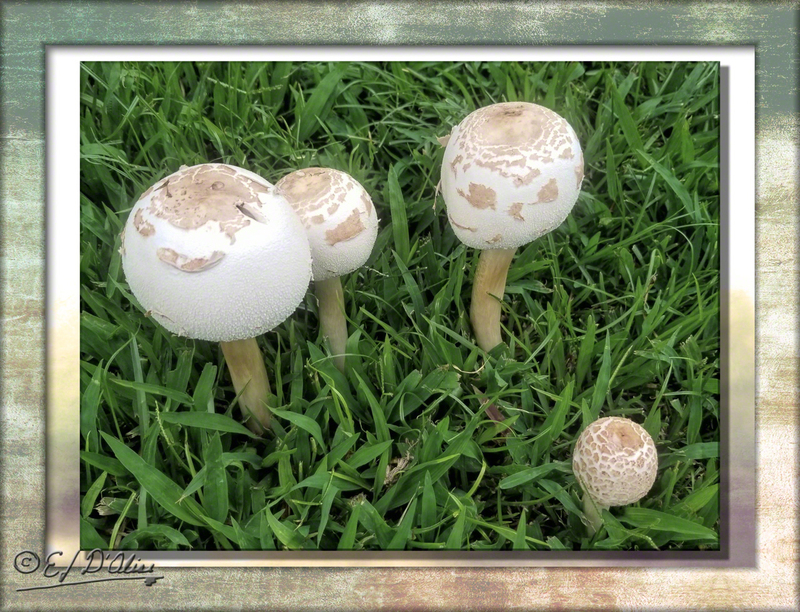 PHOTO: Mushrooms look magical to me. And I like to eat the edible ones. DOODLE: Great colors and great motion! I think the experience registers as fragmented if one only focuses strictly on photographing something. It can be a bit like movie trailers . . . grab a few scenes and you can make the movie seem something completely different than what is ultimately delivered (often, not as good as promised). The same scenes are there, but out of context and relative to the whole, they might not represent the totality of the offering. And thanks . . . I’m hoping I can keep offering stuff up that you-know-who finds stimulating (usually negatively). That way, it gives you-know-who a purpose in life.